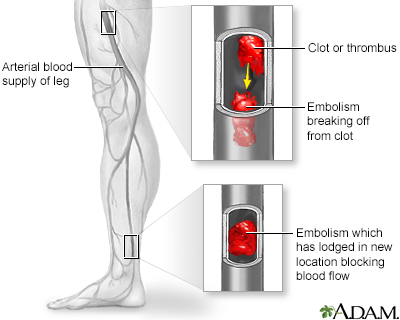 An embolism is a clot that travels from the site where it formed to another location in the body. The embolism can lodge in an artery at the new location and block the flow of blood there. The blockage deprives the tissues in that location of its normal blood flow and oxygen. This can result in damage, destruction, or even death of the tissues (necrosis) in that organ. Arterial embolism requires prompt treatment, usually with hospitalization. Blood used by the body is brought back to the heart and lungs by the veins of the body. Once the blood has gathered more oxygen from the lungs, it is pumped back out to the body through the arteries.